This spring, Kat Cannell, MJ Wright, and Katelyn Spradley set out on horseback to follow a salmon’s upstream battle from the mouth of the Columbia River to central Idaho’s Redfish Lake. The young trio, who all grew up on horses and now work and guide in the outdoors, planned the 900-plus-mile trip to learn about the waterways, animals, and stakeholders involved in a salmon’s journey to spawn. Competitive endurance riding challenges a horse’s athletic ability, stamina, and conditioning over rugged routes ranging from 50 to 100 miles. Because of the sport’s strenuous nature, endurance horses are at risk for colic due to dehydration, fatigue, and metabolic disorders. Colic prevention, early intervention, and proper management during competition can mean the difference between life and death for endurance horses, said Yvette Nout-Lomas, DVM, PhD, Dipl. ACVIM, ACECC, assistant professor of equine internal medicine at Colorado State University’s Veterinary Teaching Hospital. Horse owners who live in the United States, are 18 years of age and older, and who currently own or manage at least one horse are invited to complete American Horse Publications' survey by April 1, 2018. A Trump administration proposal sets wild horse populations at extinction levels. Most Americans want to preserve wild horses on the Western range. Their independence and unbridled freedom symbolize the qualities that make our country great. But their future in 10 Western states is in jeopardy, thanks to a Trump administration proposal to reduce wild populations to extinction levels by killing as many as 90,000 of these iconic animals. 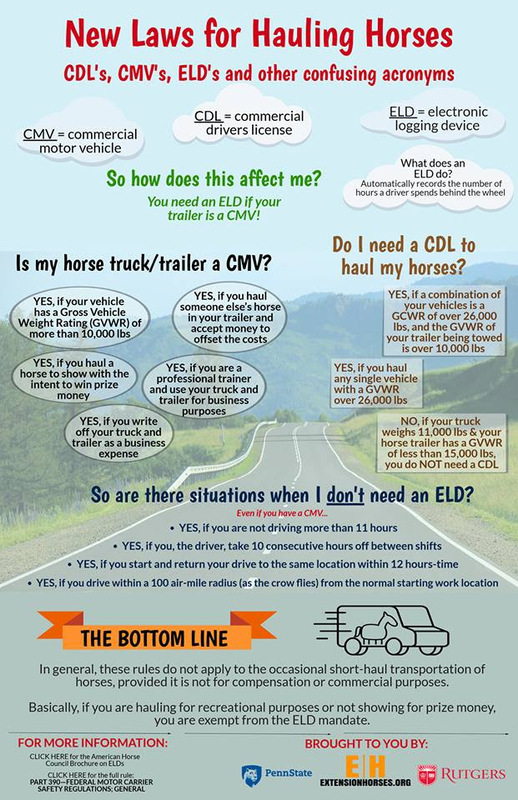 (Washington, DC)- The American Horse Council (AHC) will host its 1st Quarter 2018 webinar on Monday, February 12th at 3:00 pm ET and will address the recent Electronic Logging Device (ELD) Mandate that has caused much confusion and a lot of questions throughout the equine industry. The webinar will address the details of what the ELD Mandate includes, and who is required to have an electronic logging device. We will also discuss requirements for Commercial Driver’s License (CDL), as well as what the AHC is doing to mitigate the effects of the proposed changes on the equine industry. Both AHC members and non-members are encouraged to attend the webinar. The webinar will also be recorded and posted on the AHC website for those that could not attend. Please register online here, and you will receive an email with login instructions two days before the webinar date. Highlands, NC – Jan. 23, 2018 – Advanced Equine Comfort LLC today announced the launch of its newest glue-on horseshoe, Easy’s Performance Slipper™. No longer solely for therapeutic relief, Easy’s Performance Slipper is a more streamlined model of the original Easy’s Slipper®, providing the same patented hoof support, but with a newly contoured shape for peak performance in all types of riding disciplines. The material of Easy’s Performance Slipper remains the same thickness on the sole of the slipper to continue to provide the best shock absorption and shock vibration dissipation of any boot or glue-on presently on the market. The Easy’s Performance Slipper patent is pending the U.S., U.K. and 28 European communities. It is offered in all three original Easy’s Slipper styles, including the open bottom rocker, closed bottom rocker and heart bar. The original Easy’s Slipper is still available, and continues to be the leading therapeutic glue-on horseshoe that provides shock absorption and vibration dissipation to improve joint and bone health. It is both FEI and USEF approved for competition. Easy’s Slipper, from Advanced Equine Comfort LLC, is the therapeutic glue-on horseshoe that provides shock absorption and vibration dissipation to improve joint and bone health. Easy’s Slipper encourages hoof growth and physical movement to grow healthier hooves and happier horses. The superior shock absorbency decreases stress on the bones, ligaments and joints, allowing natural flexing of the hoof, resulting in enhanced blood flow and increased oxygenation of the horse’s body. The built-in rocker can be easily adjusted by a farrier for the desired breakover for proper movement and soundness. Q. Last week in your article about helping horses stay warm in winter you mentioned feeding sugar beet pulp to horses in need of extra calories from a forage source. It doesn’t seem like that would be a good choice for a lot of horses. Isn’t sugar beet pulp high in sugar? A. The name certainly implies that this common equine feed ingredient is high in sugar. However, you might be surprised to learn that by the time it makes it to your horse’s feed bucket sugar beet pulp, in most cases, is actually very low in sugar. Sugar beets are a root crop with a high concentration of sucrose sugar (think table sugar) grown commercially for sugar production. According to the American Sugarbeet Growers Association, sugar beets are grown in many Western and Northern states. The sugar beet is about a foot long and weighs between 2 to 5 pounds. With a sucrose content of about 18%, sugar beets make up a little over 50% of the domestically produced sugar. Arabians have conquered Scottsdale, Arizona with love and affection - not the warring Bedouin tribes from the Arabian Peninsula [VIDEO] thousands of years ago, but rather the 1,000-pound, four-hoof Arabians. They yearn to be stroked and scratched, and the signature neck - missing one vertebra - loves to have a human arm around it. If you blow in their nostrils they will follow you anywhere. Q. After a recent ride, I picked up my horse's hoof and found that the frog was hanging off. I've included a photograph I took of it. Why is my horse's frog falling off, and what should I do about it? Is he okay? Good morning AERC BoD and members, USEF and FEI representatives. I know a great many of you, and I know how difficult it can be to navigate the turbulent waters of the AERC BoD or Committee Chair role. I served on the BoD for one term, and also served for a long time as Chair of the Ride Managers’ Committee. So first off, thank you for your service to the organization and the sport I know we all love. I’ve learned that the amount of time spent on Facebook and my mental health are inversely proportional. Horses in few disciplines require as much high-energy nutrition as racehorses. So it’s no surprise that, traditionally, a large part of a racehorse’s food ration is energy-dense concentrated feeds. But concentrates are hard on the equine stomach, contribute to gastric ulcers, and lack the bulk and fiber content that keep a horse’s gut healthy. It happens every winter. A horse that may not even have a prior history of laminitis is found to be very lame and reluctant to move. It’s more than the typical hesitation horses show on hard, frozen ground. Looks like laminitis but the feet aren’t hot. What’s going on? Cold-induced hoof pain strikes horses with insulin resistance. IR is a well described risk factor for laminitis and even when the horse is not glaringly lame it is causing damage to the laminae. We haven’t uncovered all the mechanisms behind laminar damage from high insulin levels but one known factor is elevated levels of endothelin-1. I manage endurance horses. I have experience using alfalfa during races, but I have been told to not use it between races, when I’m training, as it could cause metabolic problems. Can you please tell me your thoughts? At a competition, there is no better forage for endurance horses because of its palatability, high calorie content, and nutrient profile. However, it is not usually fed to endurance horses as the only forage on a day-to-day basis.